We do not require an internship, but we strongly urge you to do at least one. Two or three is better! Internships help build your skills and your professional network. You can do an internship after your first year at UMass; it’s generally preferred that you take Journalism 300 before doing an internship. An internship is a period of time students spend getting supervised, practical experience in the workplace, usually while receiving university credits. Internships help you gain a wide assortment of skills that you do not learn in the classroom. They are usually unpaid. You can do full or part-time internships, up to a total of 18 credits. The number of credits you earn is based on the number of hours worked per week; for example, a full-time (40 hours per week) summer internship (10 weeks) earn you 15 credits. You can intern during the semester and over the summer. 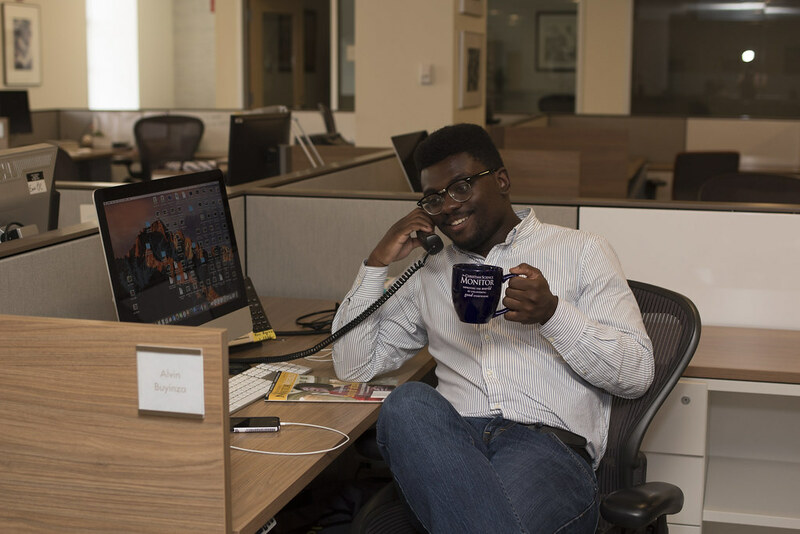 Some students do on-campus internships during the school year for organizations like the UMass Press, the UMass News Office, and UMass magazine. Others intern in places like Washington, New York or Boston, or even their hometown. It’s up to you. UMass requires that you complete at least 45 credits before you enroll for internship credits. However, the increasing competitiveness of the major internships requires applicants to have had at least one previous internship experience. So, if you can, start early and work often, even if you do not receive academic credit. As a first-year student or sophomore, you could arrange a summer internship at a local newspaper or other media outlet or organization in or near your home town. As you enter your junior year, having already had some internship experience, you’ll be ready to apply for the more competitive internships. Most students do internships over the summer, but you can also do an internship during the academic year. In fact, your options widen considerably if you are able to do a full-time internship during the school year, when there is less competition from other students. This is especially true for internships in New York or Washington, D.C.
Our students have interned in an amazing array of sites, from The Onion and The Daily Show to The Today Show, MTV, New York Times’ T Magazine, Boston Magazine, The Boston Phoenix, New England Sports News, Women’s Wear Daily, MassLive.com, in addition to scores of local and regional newspapers and magazines and other media outlets. Students interested in law can intern with the local District Attorney’s office or in the local office of our State Senator. Students interested in marketing work at public relations companies in Boston or New York. Students with an interest in social justice can work with non-profits involved in the environment, women’s reproductive rights, media policy or other areas. With the increase in communication via the web, every organization now requires a story teller who can help them create and manage their online presence. Journalism majors have the skills to do these jobs. If you’re looking for your first internship or if you need to be at home over the summer, you can arrange an internship on your own with your local newspaper, radio or television station. Contact public relations firms, advocacy groups, politicians’ offices, religious and community organizations, publishing companies and sports and arts groups. Many of these places take on interns with writing skills to help with their newsletters, web sites and press releases. There are also online internships. Tell them you’re a journalism major wanting to do an internship. Most places are happy to have free help. More competitive internships also are available at major newspapers, magazines, media outlets and other organizations. They can be located anywhere in the country. The applications for these internships may be quite extensive, requiring essays, clips and portfolios, and most have early application deadlines. So you should start the application process early. I really want to work for the Boston Globe. What can I do? The Boston Globe offers a Co-op program, which runs for two six-month stints. You can apply for the Spring semester, January to June, or Fall, June-December. These are paid positions at the Globe newsroom on Morrissey Blvd. in Boston, or in the bureaus. These are not writing positions, but some students have worked their way into writing assignments after they’ve proven themselves. These positions are very competitive, and you should have at least one smaller internship before applying. You should talk to Internship Coordinator B.J. Roche if you are interested in these positions. She can help you with your application. What if I can’t afford to do an internship? • The College of Social and Behavioral Sciences has many scholarships to help students pay for summer internships. We strongly urge you to apply! • The Journalism Department also provides assistance to students in unpaid internships. Scholarship applications are available in the spring semester. • Many internships recognize that interns may also need to work at paid employment and are willing to be flexible in arranging your schedule. Tell them about your requirements during the interview process. Co-ops are similar to internships but are different in several key ways. Co-ops require a longer time commitment, usually between six and eight months. A co-op is more likely to be a paid, pre-professional position and be directly related to your area of professional interest. Take the Internship Workshop at Career Services in Goodell Hall. This half-hour workshop is offered twice a week during the semester. It introduces you to the internship process, and provides you with a code number so you can search for internships on the E-Recruiting site. Check out the Journalism Launchpad Blog. The links on this page offer lots of resources and internship listings. Build your portfolio. Now. If you have no clips, go to the Collegian and get some! (Employers always check to see if you’ve worked for campus media. If you haven’t, they will wonder why.) If you’re interested in working in radio or TV or online, go to WMUA, the Union Video Center or Amherst Wire. These are all located on the UMass campus and are easily accessible. Write a resumé and keep it up to date, and create an online portfolio of your best work. Attend a resumé writing workshop at the Career Services Office in 511 Goodell, which also has resources about resumés and cover letters. Think “resumé building” as you plan your time at UMass. Take advantage of the resources at UMass to add to your marketable skills: learn a foreign language. Take some Computer Science or Information Technology courses. Complete a certificate. Engage in a service learning program. You’ll build your resume with these activities, and they’ll also make you a more engaged citizen. Win-win! What do I do once I have the internship confirmed? Once you confirm that you will be interning, you will usually need to enroll for academic credit. Remember that internship credits count toward graduation but do not count toward the major. Once you confirm that you will be interning, you will usually need to enroll for academic credit. Remember that nternship credits count toward graduation but do not count toward the major. In Summer and Winter session, you enroll for credits through Continuing Education. You must pay for these credits. That may come as an unpleasant surprise, so please take note of this. If you do not need the credits, you may be able to enroll for just one or two credits, regardless of the number of hours you actually work at the internship. So don’t let this discourage you. You are covered under the University’s insurance policy. A counselor from Career Services will visit the site of your internship to be sure the internship is going well. In the Fall and Spring semesters, Journalism will enroll you for the credits on SPIRE. The credits are included as part of your regular tuition at no additional cost. You will need a sponsor. Most student work with Internship Coordinator B.J. Roche. She will help you fill out an Academic Contract and instruct you on the next step. You are required to keep a journal of the work you do on your internship, as well as a portfolio, if applicable. At the end of the internship, you will use the journal to write a four to five page paper explaining and evaluating your experience. What did you learn? How did it contribute to your thinking about careers? What kinds of ethical issues did you have to deal with? What would you like to do next? Would you recommend this internship to other students? Your supervisor at the internship will evaluate your performance. If you choose not to enroll for academic credit for an internship, you do not need to fill out any forms or do any paperwork with Journalism or with the University. But you should let B.J. Roche know how it worked out and discuss future internship plans. It is possible to do an internship after you graduate through the UMass Second Chance Program, which allows a graduate to be placed on special status so you may still enroll for internship credits. This is important because many sites require interns to be enrolled for academic credits. This program enables you to continue to take advantage of internship opportunities. You can get more information about this in Career Services. There are other post-graduate internship and development opportunities offered through many professional organizations, such as the Poynter Institute and the Institutes for Journalism and Natural Resources. The Hearst Newspapers offers a two year fellowship program for students immediately after graduation. Fellows complete three to four job rotations at different Hearst newspapers around the country. Contact B.J. Roche, Journalism Internship Coordinator, at 413-545-5930 or contact Career Services.